So sorry that my TT’s have been so random lately. Most of my computer time goes to checking email and then, I usually get a few words written here and there, but no real chunks of time to get whole posts completed! Such is the life with a twelve week old and a nearly three year old! This weeks tip: Sewing it Yourself! I’ve made quite a few things myself, with my handy-dandy sewing machine (next week’s tip – Bumming Sewing Machines off Your Mother 😉 ). I’ve made costumes and a nursing cover and bags to store H’s toys. But my favorite thing of late is my mei tai! 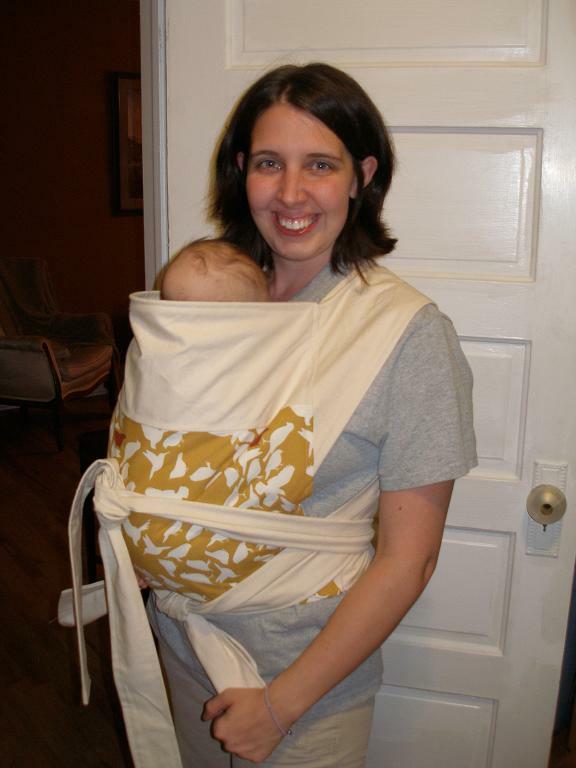 A mei tai is a baby carrier, inspired by Asian design. My friend had recently bought one called a Freehand. After going to a baby wearing class with her (to figure out how to nurse in my Moby), I saw the mei tai demonstrated, and loved the design… Just not the price tag; $80!! So I did what I always do, I searched craigslist for a used one. After a couple weeks of no luck, I googled some sewing instructions (see them here & here), and I made one myself! 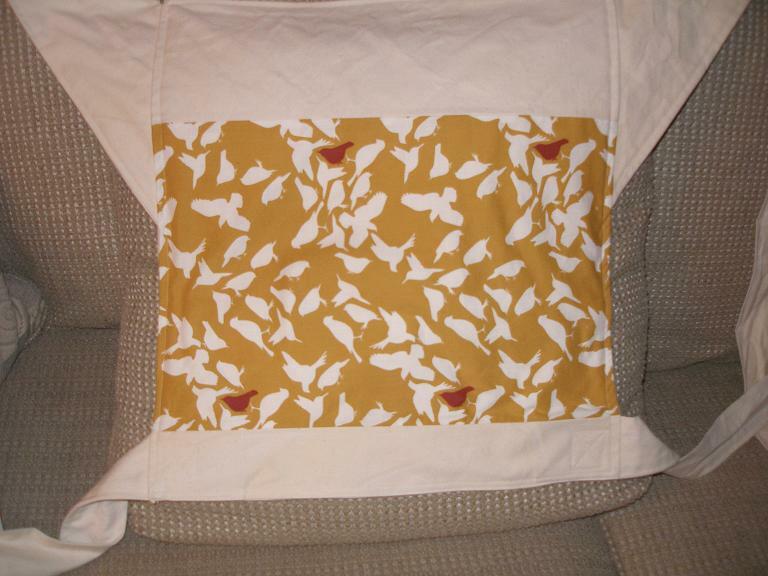 Mine is made from 10.10 oz unbleached cotton canvas with a cotton panel of cool bird fabric that I didn’t get the name/designer of (as always, click the pictures for the best view). It took me about three hours to complete it, not counting washing and stopping to feed E and eat dinner myself. Originally, I was going to pad the straps, but after seeing and feeling the width I decided it wasn’t necessary. I am so pleased with how it turned out! I wore it to the farm last week and it was fabulous and much cooler than the Moby, since there was so much less fabric. I also left one side with out the birds so that it could be reversed for Rick to wear (though the birds aren’t overly girly anyway). I still love the Moby too, but this is a great alternative, and is frankly a bit more user friendly. In total, I spent $20 and three hours. It would have been a bit less if I hadn’t bought the padding too. What a savings! 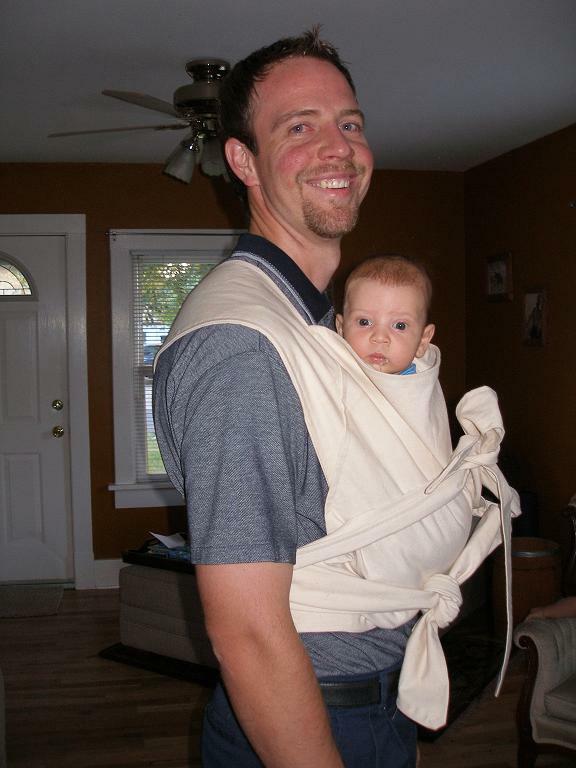 LOVE the baby carrier! had been looking for a pattern and had not run across those links yet. these seem a lot easier than the ones i was going to ‘try’ to replicate. wanted to make one for a friend and now i have the resource – this helped a lot – thank YOU. oh, are you coming to sewing club?